When someone arrives on your sales page, he or she is in between pure curiosity and “about to make the purchase” mode. Your sales page has to appeal to all of these types of people (no matter what stage they’re at) in order to convert well. It’s a very fine line. If you’re too brief or vague, you’ll lose out on the people who don’t understand the product or who haven’t made decisions by the end of the page. If it’s too long or sloppy, you might bore people, and long copy, when done incorrectly, has the potential to be seen as spammy (such as on those obnoxious Clickbank weight loss sales pages). Here’s how you dance on that line and reap the rewards of appealing to all of your potential customers. This is your framework. Use the guidelines in relation to your own product or service, and watch as you convert better by appealing to more interested users. The first thing to get out of the way is the classic debate of long copy vs. short copy. 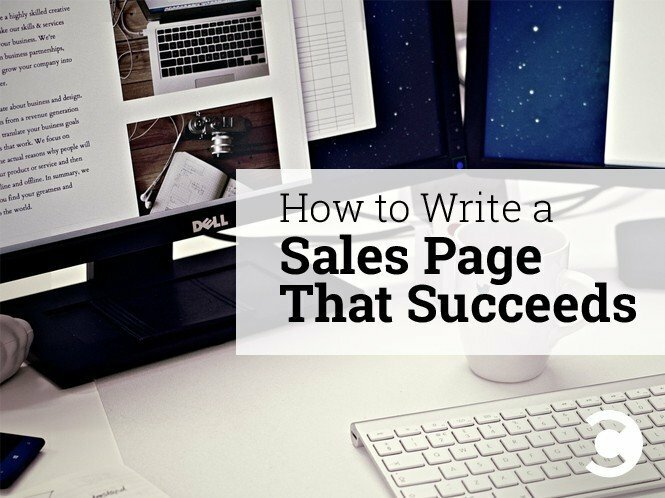 Some people think that short sales pages work; some people think that long sales pages work. For the vast majority of products, long copy is needed. Can just short copy convert well? The answer is yes—If you follow our advice below, you’ll be getting plenty of clicks and conversions from the short copy section of your page. However, typically in the case of a selling a product, more explanation is needed. This is why you put the long copy below your short copy and allow people to act before even getting to the long copy. The long copy captures the people who are still in curiosity mode and not quite convinced of taking action yet. So, our page will contain both long copy and short copy elements. Let’s move onto what those elements are and where they should be placed. Your page should open with a short headline (1–2 lines) that’s big and easy to read. When visitors first arrive on your page, they’re going to decide almost instantly whether they want to stick around to continue learning about your offering or leave. If there’s one key takeaway, it’s that coming up with a great headline can be the difference between 1,000 views and 100,000 views. It can also be the difference that gets visitors to read your blog post at all, since on average eight out of 10 people will only skim the headline before moving on. Next, you should have some very short paragraphs (or preferably one-line bullets) going over exactly what your product is and why it’s so good. The goal here is to make your visitor say, “Oh my gosh, I’ve been looking for something exactly like that!” or, “Wow, that sounds pretty darn cool and right up my alley, let me read more.” It’s your chance to turn pure curiosity into something more. Below this very short copy should be a CTA that allows people to quickly move off of the sales page and onto the conversion process. If the visitor was already in buying mode, and you let them know that you have exactly what he or she needs, there’s a good chance he’ll hit the CTA and convert. If the visitor was in curiosity mode, and you peaked his or her interest, he’ll carry onto the long copy below to learn more. Take two extremes of useful vs. cool bullets: a landing page saying to submit your email for a how-to guide, and a landing page that sells fake lightsabers that light up, make noises on impact, etc. If your how-to guide is free or cheap, you won’t need a whole lot of convincing to get the visitor to convert, and your short copy will do most of the work. On the other hand, if you’re selling a non-essential product like that lightsaber, you’ll need to sell the reader on the features of your product, and the short copy will just serve as a device to capture the reader, build value behind your product, and hold him or her in your arms as you explain more. Amazon does this basic structure very well. Go to any Amazon product, and you’ll see those five bullets right underneath the price, followed by the product description a bit further down the page for the genuinely curious people who take the time to scroll past the buy button, related items, and sponsored items. The long copy should be placed under your CTA. Often times, people think that “long copy” is one of those sales pages where your scroll bar shrinks to a millimeter. It’s not. Traditionally, short copy is something like a television, newspaper, or radio ad—you get room for only a couple of lines, just like you did with your bullets above. Long copy is anything that’s significantly longer than that. But it doesn’t have to be too long. 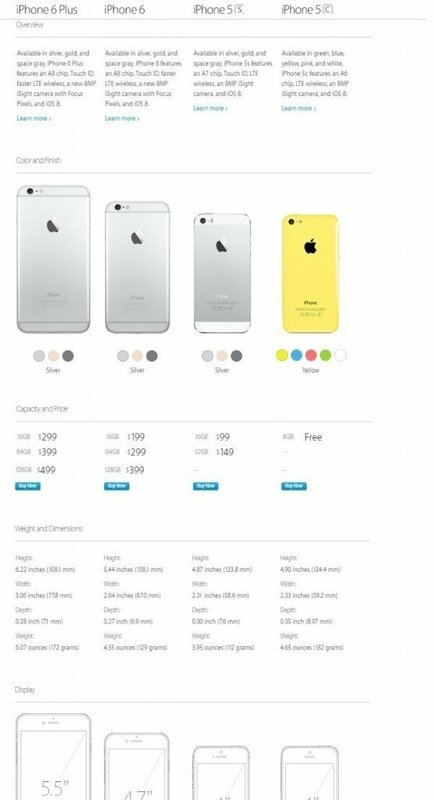 Take a look at the long copy for the iPhone 6. Is it paragraphs upon paragraphs of text? It’s not—but by the end, you’re completely educated on the product and why it’s so awesome. That’s because Apple’s copywriters know that less is more. The key is making your “long copy” look as much like short copy as possible, as that’s what people like reading most. Try to keep paragraphs to a minimum of 3–4 lines with a short width. These short paragraphs should be titled with one or two-line headers so that the reader doesn’t have to commit to reading a paragraph before he or she knows what the section is about. This seems trivial, but remember, you do not have the undivided attention of your visitor. Do everything you can to make it as easy as possible for him or her. You’ll see that Apple throws in a ton of pictures along with its iPhone because one of the iPhone’s main features is its cosmetics. These pictures also break up the page—no one likes reading text on text on text on text—it’s just hard to do! But make sure that the visitor knows what the heck your product is before you start spouting all this off. These promotional elements should explain the product towards the top of the page. Then, once the reader understands what he or she is looking at, start playing up its unique strengths and benefits in comparison to other products at the bottom. Apple does this, too. 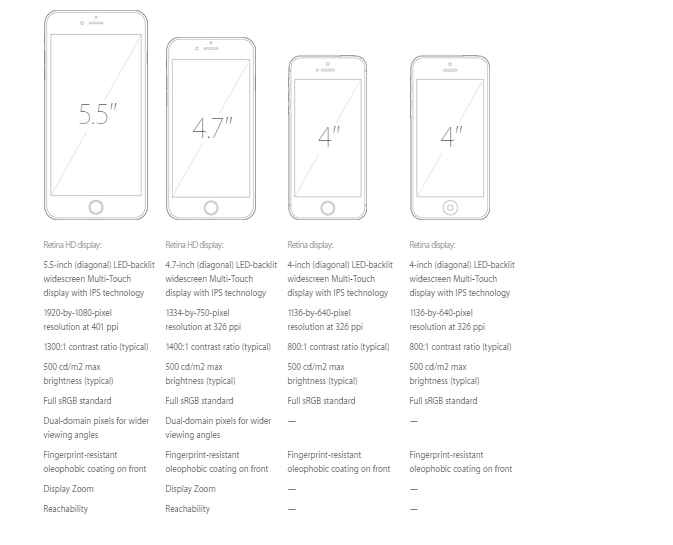 At the start, you see things like the dimensions of the product, and at the bottom, you’re introduced to its unique features like Apple Pay. Apple does this with its “Learn more” links underneath each individual section. The user is invested in learning more at this point—give him or her the option to do so! You don’t want to force him or her to scroll up or down in order to move off of the sales page. You should also sprinkle in CTAs for the sale, but not too frequently. Plastering a page with buy buttons makes it look low-value. The result is a sales page that captures users quickly and keeps them interested. Short copy alone scares off anyone who isn’t confident by the end of it. Long copy alone doesn’t convert people fast enough, and some might get bored and leave. Use the elements above to take advantage of the benefits of both short and long copy. Right now, take a look at your sales page, and see if you’re missing anything. If you are, add it in, and watch your CTR and conversion rate go up. Josh Brown is part of the marketing team at Soldsie, a social-selling platform that enables retailers to sell their items directly to customers over social channels like Facebook and Instagram.